Definition at line 25 of file CommonPool.h. Definition at line 311 of file delay_pools.cc. Definition at line 249 of file delay_pools.cc. References Aggregate::Aggregate(), fatal(), RefCount< C >::getRaw(), NULL, DelayVector::push_back(), and typeLabel. Referenced by DelayPool::createPool(), and DelayPool::DelayPool(). Definition at line 27 of file CommonPool.h. Definition at line 31 of file CommonPool.h. References CommonPool(), String::termedBuf(), and typeLabel. Definition at line 35 of file CommonPool.h. 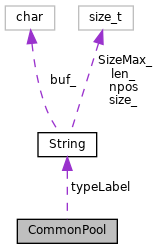 Referenced by Factory(), and theClassTypeLabel().